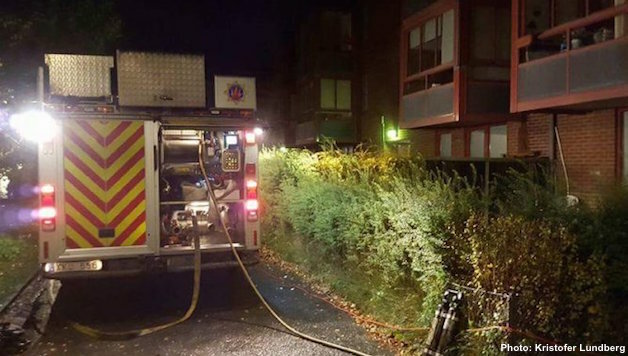 Three apartments belonging to members of Rättvisepartiet Socialisterna (CWI in Sweden) were subject to arson attempts at 3 am in the morning on Sunday. Two days earlier, the first school killings in Sweden took place when a racist young man stabbed two people to death and seriously wounded another two. In the same week, five buildings that were used to house refugees or were planned for such housing were burned down in different parts of Sweden. What is going on in Sweden and what are the perspectives? The arson attack against CWI members took place in one of the party’s strongholds, Hammarkullen in Gothenburg. One of the apartments belongs to Kristofer Lundberg, chairman of RS in West Sweden, who is also chairperson of a Tenants Association for a district covering northeast Gothenburg, including Hammarkullen. The party in Gothenburg is well-known for its many local campaigns on housing and against cuts, for its leading role in anti-racism work as well as for its support for the Kurdish struggle. The perpetrators tried to set fire to three apartments through their letter boxes as well as five rubbish chutes in the staircases. Luckily, one fire was discovered immediately and the fires in the letter boxes were quickly extinguished. It took 35 firefighters three and a half hours to extinguish the fires in the staircases. A group of RS members gathered immediately and a meeting was called for 12 o’clock. The comrades decided to inform every household in the area and invite all residents to a meeting later the same day, organised in the party’s name. 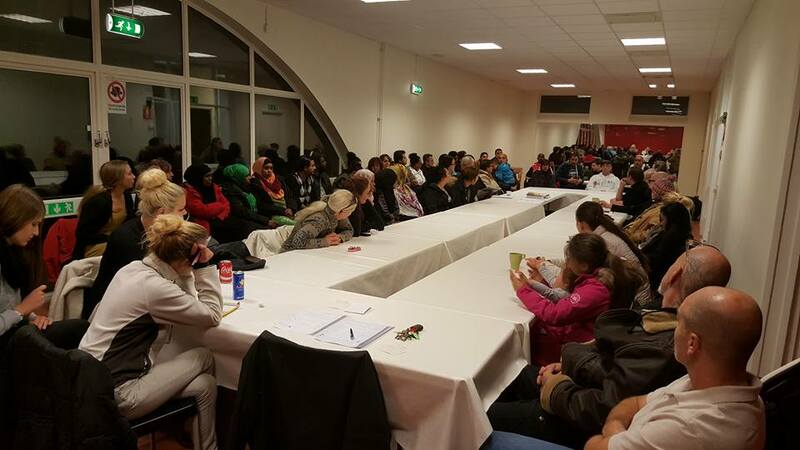 Over 70 people came to the meeting, with many expressing solidarity and a willingness to act. Some took on the task of forming a night patrol while others were put on stand-by. An outdoor rally is being called for Tuesday and a new mass meeting on Wednesday. Regional media have reported on this attack on our party members and the police have informally said they regard it as a political crime, linked to the fires at the refugee accommodation. Since March, 17 active or prospective centres for refugees have been affected by fires and violent attacks, a third of them during the last week. In the case of three of them, announcements that they would be used to accommodate refugees had been held just days before the fires. In an earlier survey, the anti-racist magazine, Expo, found that detention facilities for refugee children are particularly vulnerable. Then, on Thursday 22 October, a racist terrorist attacked a school at Trollhättan, a town in West Sweden. Anton Lundin Pettersson came to the school disguised as some kind of knight, a variant of the Norwegian Anders Behring Breivik’s “chivalry”. On his head, Lundin Pettersson wore a German army helmet from World War II. He had two weapons with him, a sword and a long knife. In a farewell letter he wrote that “foreigners” were going to be the target of the attack and that, “Sweden should not take in so many immigrants”. He chose a school with a large immigrant population and his victims were chosen based on their skin colour. A 20-year-old student assistant, Lavin Eskander, was killed when he tried to stop the attacker while 15-year-old Ahmed Hassan was stabbed to death as he opened a door. Two other victims were seriously injured. The killer had a YouTube account with a clear focus: films that celebrate Hitler and Nazi Germany, as well as the incitement of racism against Islam and Jews. He also ‘liked’ material from more contemporary Nazis, including a blog that propagates “the importance of race in society”. As in the case of Anders Behring Breivik’s “manifesto”, multiculturalism is seen by him as a “project from hell”. This terrible terrorist atrocity and the other attacks were carried out against a background of increased polarisation in Sweden, with the scapegoating of refugees and talk that “we cannot accept any more”. Racist hatred on the internet is increasing. The attacks on refugee accommodation have been applauded by anonymous racists who have shouted “finally!”. A local politician from the racist party, the Sweden Democrats, wondered why a machine gun nest was not erected on the Oresund bridge in an online post a few weeks ago. Over the past week, the Sweden Democrats have urged their followers to “take action” to stop refugees and the allocation of refugee accommodation. “Now it’s kicking off with a bang”, said Kent Ekeroth, an MP for the Sweden Democrats in his speech at a rally in Trelleborg in the south of Sweden. The Nordic countries have seen heinous racist acts of terrorism before. During a six month long period in 1991-92, the ‘Laserman’, John Ausonius, carried out eleven gun attacks, one of which had a fatal outcome while many others were seriously injured. During 2009-10, Malmö was terrorised by ‘Laserman 2’, Peter Mang, who murdered two people and attempted to kill at least six others. Anders Behring Breivik killed 77 people and injured another 42, the majority of whom were young Social Democrats at their summer camp at Utøya. Common amongst all three was their racist beliefs. Ausonius, Mang and Breivik were all convinced of the idea that immigration amounts to an invasion by inferior people. In addition, Nazis have been behind the murder of at least 30 people in Sweden since the mid-1980s. This is not a question of mental illness or “lunatics,” as some tried to claim about Breivik. It is political, racist murder and terror, which in each case is connected to the far-right, racist and Nazi milieu. It is possible that the people behind the attacks are disorganised but they have got their ideas from, and have been supported by, organised racists. The Sweden Democrats’ policies are dominated by the slogan of “A total ban on asylum immigration”. They spice it up with nationalist demands for more attention to be given to the national flag, the king and the national anthem. We answer them by highlighting their proposals for cuts and privatisation. For example, they propose that state grants to councils should be cut down from 94 billion SEK (9 billion euros) to 41 billion in 2018 – equal to a cut of 100,000 council jobs. Even today, the SD wants to abolish the aid given by the state to the municipalities for assisting newly arrived asylum seekers. The Sweden Democrats spread lies that fewer refugees would allow more money to be given to pensioners and social welfare. But the trend towards cuts in the care and welfare sectors has been taking place for over 20 years, regardless of the number of refugees – and has been supported by the SD. This applies both in Sweden and in other countries. Increasingly, right-wing politicians from the establishment want to approach SD for co-operation. At the same time, the party is increasing its racist harassment and attracting Nazi supporters. More refugees are arriving in Sweden than at any time since the Second World War. The latest estimate is that 140,000 -190,000 will arrive this year. Initially, even establishment politicians sensed the strong opinion of solidarity from ordinary people. The Social Democratic Prime Minister, Stefan Löfven, even spoke at the first ‘Refugees Welcome’ demonstration which was attended by 15,000 people. However, in line with the rest of the EU’s politicians, the government (Social Democrats and Greens) has now come to an agreement with the four parties of the traditional bourgeois opposition on introducing a more restrictive policy. This includes temporary residence permits, more stringent security requirements for family reunification, the quicker carrying through of deportations, that refugees coming to Sweden can be passed on to other EU countries and that those arriving can be forced into low-paid, precarious jobs. Among workers and ordinary people, as in other countries, there has been a sharp shift in opinions regarding refugees. In late September, 44 percent said Sweden should take more refugees, compared to 28 percent in February. 31 percent even said they would consider housing a refugee in their own home. Thousands have been involved as volunteers at railway stations and makeshift refugee hostels. Money collections have been organised at workplaces, schools etc. and record amounts have been raised. We need an anti-racist movement that acts against racism everywhere. In Trollhättan, 5,000 took part in a demonstration three days after the school attack. The mood was a mix of sorrow and strong anti-racism. We know from the last decades that racism and Nazism can be pushed back by large mobilisations, campaigns and activities at workplaces and schools and in residential areas. At the same time, we stress that anti-racism has to fight against austerity and neo-liberalism, the policies that give racism a breeding ground. Trade unions, networks and rank-and-file organisations must fight for work, housing, healthcare and education for all. Local governments must be given an enormous increase in resources in order to stop the cuts, expand welfare and provide assistance to refugees. But this struggle must also be about defending the right to asylum, against the agreement that the government has just recently made with the right-wing parties. Deportations and a more restrictive refugee policy only encourages the racists in promoting the idea that accepting fewer refugees is some kind of way forward. The capitalist system and its politicians want to attack one group at a time. In Sweden today, attacks on refugees are accompanied by cuts in healthcare. As socialists, we stand for struggle against all variants of austerity. We stand for common struggle against racism, as well as capitalism and imperialism which create it and for justice and socialism.